If you’ve been following this blog for any amount of time, you probably realize that we take parties seriously here in the Soukup household! Princess has been planning her owl party since last November even though her birthday isn’t until August. Trouble isn’t quite the obsessive-compulsive planner that her big sister is turning out to be, but she definitely has an opinion when it comes to picking her themes. This year, for her big 4th birthday party, she is ALL about mermaids. Trouble–our little social butterfly–was actually born right on Memorial Day (remind me to tell you about her home birth party sometime!) which means her birthday is always the perfect excuse to throw a big Memorial Weekend pool party for all our friends. This year will be no exception! Be sure to check out last year’s Let Them Eat CAKE party as well as her Sweet Soda Shop party from two years ago for more fun party ideas! So what do you think of this year’s theme? Are you feeling the mermaid groove? What kind of party planner are you? Love it! Trouble will have a blast! You always have the best party ideas! Such cute ideas! 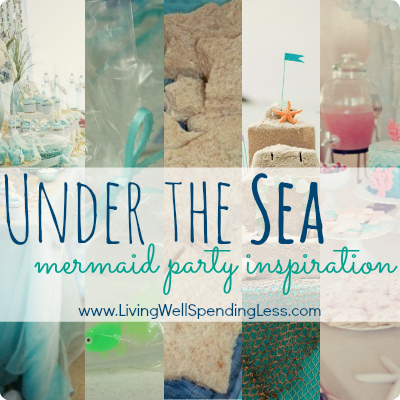 Love the mermaid theme! So stinkin’ cute! I wish I had girls!!! So fun!! Of course with all boys… but my littlest guy IS rather obsessed with Mermaids right now! And what a coincidence that today my crew and I happened to be taping on the new “Under The Sea” ride at Magic Kingdom. Weird! Love this sweet round-up and all of your great kid’s party ideas! Very cute! I’m sure she’s very excited! My daughter will be 6 next week and talking about her bday for ALONG time. We did a dolphin party for my six yr old back in March. It was fun and I totally enjoyed decorating for it! Have fun! Can’t wait to see your pics! Love! Can’t wait to see the party pics! I believe that the link you posted credited Hana to both her blog address and her photog site. Great ideas all the way around! was turning black. Natural Remedies to Reduce Hypertension. article. I’ll be sure to bookmark it and return to read more of your useful info.